ఈ article, the district గురించి. For its eponymous headquarters, see Pali, Rajasthan. Pali District (Rajasthani: पाली जिल्लौ) (Hindi: पाली ज़िला Pālī Zilā) is a district of the state of Rajasthan in western భారత దేశము. The town of Pali is the district headquarters. During the Kushana Age, King Kanishka had conquered Rohat and Jaitaran area, parts of today's Pali district, in 120 AD. Till the end of seventh century A. D. this area was ruled by the Chalukya King Harshavardhana along with other parts of the present state of Rajasthan . The Aravalli Range forms the eastern boundary of the district and towards southern boundary it ends at Bamnera village in Sumerpur Tehsil. A zone of foothills lies to the west, through which run the many tributaries of the Luni River. The western portion of the district includes the alluvial plain of the Luni. It is bounded by eight districts, Nagaur District to the north, Ajmer District to the northeast, Rajsamand District to the east, Udaipur District to the southeast, Sirohi District to the southwest, Jalore District and Barmer District to the west, and Jodhpur District to the northwest. The major part of the district has elevations ranging from 200 to 300 m above MSL, but in the east toward the Aravalli Range the elevation increases and the average is nearer 600 m and at some places the elevations exceed 1000 m.
Pali is located between 24.75 degree to 26.483 degree North latitude and 72.783 degrees to 74.30 degree East longitude. The area under irrigation is 2824.02 km2, which is about 22.79 percent of the total geographical area of the district. The main source of irrigation in the district is wells, which constitute seventy-five per cent of total irrigated area followed by ponds tanks twenty per cent, tube wells 5 per cent. In all; district has ninety-two dams out of which three dams, one each at Gajni, Potalia and Chipatia are broken. Total catchment area of all the dams is 238,150.14 acres (963.7594 kమీ2). The capacity of eighty-nine dams was 20197.3 million cubic feet in 1990. Some of the reservoirs created by these dams are used for irrigation purposes, as well as drinking water and flood control. Jawai Dam is the largest dam in the western Rajasthan, which is very useful source of drinking water for the district in summer days. The biggest river in the district is the Luni and its major tributaries in the district are the Jawai, the Lilri, the Mithari, the Sukri, the Bandi and the Guhiya. Guhiya river originates near Khariyaniv and Tharasani villages in Pali District in the hillocks. It merges with Bandi River near Phekariya village. The catchment is about 3,835 km², which is situated in Pali district. Its tributaries are Raipur Luni, Radia Nadi, Guria Nadi, Lilri Nadi, Sukri and Phunpharia Bala. River Khari is formed by the confluence of small streams namely Somesar (origination: near Somesar village in the western slopes of the Aravali), Khari Kherwa, Umrawas Ka Nala (origination: Near Bagol Kanklawas in the western slopes of the Aravali) and Kotki Nadi (origination: Dewair Reserved Forest Bhakar, after flow of about 30 km). After joining of all these small streams, the river is called Khari. After flowing for about 25 km, it joins Bandi River downstream of Hemawas reservoir . Its catchment area is 1,232 km². Near Bombadra pickup weir Khari and Mithari rivers join and form the Bandi River. Later Bandi river joins the Luni near the Lakhar village, after flowing for about 45 km. The catchment area is about 1,685 km² and situated in Pali District. Mithari river originates by confluence of local nalas in the south-western slopes of the Aravali range in Pali district only. It disappears in sandy plains near Sankhwali village in Jalore district. It flows in a north-west direction through Jawai, Bali, India and Falna for about 80 km. The catchment area is in Pali and Jalore Districts and the catchment area of this river is 1,644 km². Sukri river is formed by the confluence of several small nalas - Ghanerav Nadi, Muthana ka Bala, Magai Nadi etc. originating from the Aravallis in Pali and Udaipur Districts. It flow is in south-east to north-west directions for about 110 km and feeds Bankli Dam on the way. Near Samdari in Barmer District, it joins Luni river. The Jalore, Pali and Barmer Districts are covered in this Sub-Basin. Its catchment area is 3,036 km². Pali District have nine sub-divisions: Sojat, Marwar Junction, Jaitaran, Raipur, Sumerpur, Bali, Pali, Rohat and Desuri. There are nine tehsils: Sojat, Marwar Junction, Jaitaran, Raipur, Sumerpur, Bali, Pali, Rohat and Desuri. Rani is declared to be made 10th tehsil in Rajasthan budget-2012-13. పాలి జిల్లాలో 1012 గ్రామాలు 320 గ్రామపంచాయితీలు ఉన్నాయి. వీటిలో కొన్ని గ్రామాలు థాకుర్ల రాజ్పురోహితన్, మార్వార్ జంక్షన్, బంత టౌన్, షివ్లతొవ్, రాయ్పూర్ (రాజస్థాన్) సందెరవు, రొహత్, సొజత్ రోడ్, ఖరియ సొధ, బగ్రి నగర్, నిమజ్, నదొల్, అక్దవస్ (భటి), బగొల్, ఖిన్వర, పనొత,భరుంద, బమ్నెర, కొలివర, రానక్, సిందెర్లి, ఫిప్లియ కళ్ళన్, బిజౌఅ, బీజాపూర్, పదర్ల (పదల్ల), సెవరి,ష్రీ సెల (చౌహాన్ వీరులు) బొయ, భతుంద్, భందర్, ఘనెరవు,నన (పలి) బెద, బసంత్, చంచొరి, పునదియ, వింగర్ల, ఖిమెల్, మందియ మొదలైవి. The district is represented in the State Legislature by six MLAs (Sojat, Jaitaran, Sumerpur, Bali, Pali and Marwar Junction) and One Member of Lok Sabha in Parliament (Pali (Lok Sabha Constituency)). Presently, the Collector and District Magistrate of Pali is Ambrish Kumar. The only two modes of travel available in the district are roadways and railways. Almost all the villages are connected with the roads. There are two depots of government- owned state transport Pali and Falna. The only railway junction in the district is Marwar Junction, which is connected with Jodhpur, Ajmer, Ahmedabad and Udaipur. Pali railway station is on the Jodhpur route while the second highest earning railway station in the Ajmer division, Falna is on the Ahmedabad route. Other important railway stations in the district are Rani, Jawai Bandh, Sojat Road and Falna. The district got railway in early age of Indian Railway in 1881, when Ahmedabad-Ajmer line opened by Rajputana State Railway. Pali got connected to Marwar Junction on 24 June 1882 and to Luni on 17 June 1884. Jodhpur is connected to the district via Luni in 1885 in Rajputana-Malwa Railway network and the first train started on this route on 9 March 1885. This line later becomes part of the Jodhpur-Bikaner Railway. Phulera-Marwar Junction line get converted from Meter Gauge to Broad Gauge in 1995, while Ahmedabad-Ajmer line got converted in 1997. Till 1997-98 Jalore-Falna route of 72 km is also surveyd by the Indian Railway, but line is still not laid. 640 భారతదేశ జిల్లాలలో. 225 వ స్థానంలో ఉంది. Main existing industries of the district are Mehandi manufacturing units, textile dyeing and printing, umbrellas and wire netting, cotton ginning, ACSR conductors, agricultural equipment, conduct pipes, cement (Portland), Guar gum, handle manufacturing units, medicines, pesticides, steel furniture. To promote the industries, there are 15 industrial areas developed by the state government: Mandia road (Pali), Old Industrial Area (Pali), Pali I Phase, Pali II Phase, Pali IVnd Phase, Marwar Junction, Punayata Road (Pali), Piplia Kalan, Sojat City I & II Phase, Sojat City III Phase, Sumerpur Industrial Area, Sumerpur Industrial Estate, M/s DLF Cement Ltd. Rabariyawas, Industrial Area Bar, Industrial Area Saradhana, Rani Industrial Area and Falna- Zadri. 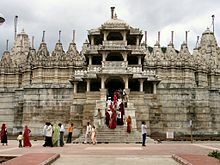 Ranakpur Jain Temple - Ranakpur is a village located in Desuri Tehsil near Sadri town in the Pali District of Rajasthan in western India. It is located between Jodhpur and Udaipur, in a valley on the western side of the Aravalli Range. The Ranakpur Jain Temples command huge respect from the Jain community worldwide. Built during the rule of Rana Kumbha, these temples have included Ranakpur in the list of five main pilgrim destinations of Jains in India. History has it that Rana Kumbha donated a vast stretch of land to Dhanna Shah so as to enable him to realize his dream of building a great temple. Today, these temples attract thousands of visitors every year from across the country and abroad. Ranakpur village is home to important Jain temples. 400+ marble pillars support the temple. Opposite the Jain temple is the much older Sun Temple.Temples of Ranakpur present a distinct style of their own. The ceilings of the temples are adorned with foliate scrollwork and geometric patterns. The top and bottom part of the domes are joined by Brackets with figures of deities on them. The most important amongst all the temples within the complex is the Chaumukha Temple. Dedicated to the first Jain Tirthankara, Adinath, it is a four faced temple which has a basement of 48,000 square feet (4,500 మీ2). The temple boasts of four subsidiary shrines, 24 pillared halls and 80 domes standing on the support of nearly 400 columns (the total number of columns in the temple complex, however, is much larger, around 1444). Each of the columns is richly carved and interestingly no two columns present the same design. Moreover, the columns change colour from golden to pale blue with the passage of every hour during the day. Parshuram Mahadev Temple is in Desuri tehsil and situated on the top of one of the hills of Aravalli. This is the famous temple of lord Shiva made by Parshuram with his axe. The temple is 14 km away from Sadri Town of Pali. The Sacred temple or than of Om Banna is 20 km away from the city on jodhpur-pali highway. This is the site where Om Banna died in road accident. The Moter bike of Om Banna is kept there for the devotees for worshiping. Nimbo Ka Nath Mahadev Temple is situated on Falna to Sanderao route. There is a myth which says that pandavas stayed here with mother Kunti during the exile. Kunti used to worship shiva at this place. Lawaji maharaj ka temple is situated on sojat city to marwar junction route, near to khariya sodha village.There is a mith which says Lawaji maharaj ( a Kshatriya warrior)secrifice his life for saving the animals like as cows. Apart from Ranakpur has also famous Jain temples of Shri Varkana Parswanath Jain Tirth, Shri RataMahaveer Jain Tirth, Muchhal Mahavir Temple, Ghanerao, Shri Narlai Jain Tirth, Shri Nadol Jain Tirth,Shri Shantinath Jain Temple Sumer,Shri Chintamani Parswanath & Shri Shankheshwar Parswanath Bagol, Shri Astapadh Jain Tirth Rani, Shri Takhatgarh Jain Tirth, Navlakha Mandir, Shri Korthaji tirth at Bamnera, Shri Manmohan Parshvanath jinalaya Banta, Falna Swarn Temple. Apart from above Pali district has other tourist attractions like Jadan Aashram, Bangur Museum, Lakhotia Garden, Manpura Bhakhari, Maharana Pratap Smarak etc. Jadan Aashram is situated in Marwar Junction tehsil of Pali district and is hardly 20 km from Pali and is famous for its 'ॐ' (Om-sacred syllable among Hindus) shape building. Maharana Pratap was born in Pali at Nanihal (house of mother's father) near Dhanmandi kachedi. It was destroyed three times and reestablished again. Meera Bai born at kudki, Jaitaran in 1498. While Nadol was once the capital of Prithviraj Chauhan's empire. Literacy rate of Pali district increased to 63.23% (according to 2001 census) from 54.92% in 1991. Male literacy is 78.16% and female literacy is 48.35% (compared to 36.70% in 2001). The district has been awarded Satyen Matriya award for its achievement during complete literacy campaign 1994. There are many schools of primary, Upper Primary, secondary and higher secondary level. Under 1986 education policy, the Pali district have a Jawahar Navodaya Vidyalaya the village Jojawar in the Marwar Junction tehsil, named as Jawahar Navodaya Vidyalaya, Jojawar. ↑ "Irrigation by Different Sources, District: Pali" (PDF). Central Groundwater Board. ↑ "National Register of Large Dams-2009" (PDF). Central Water Commission. ↑ "Adminsitrative Setup, District: Pali" (PDF). Central Groundwater Board. ↑ 12.0 12.1 12.2 12.3 12.4 12.5 "District Census 2011". Census2011.co.in. 2011. Retrieved 2011-09-30. 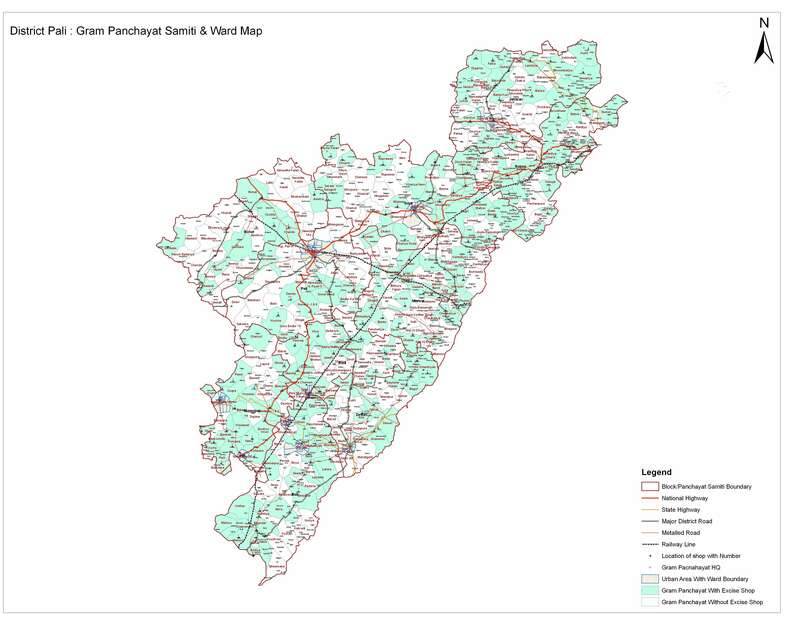 "Pali District: Gram Panchayat, Samiti and Ward Map". Excise Department, Government of Rajasthan. Archived from the original on 11 March 2012. 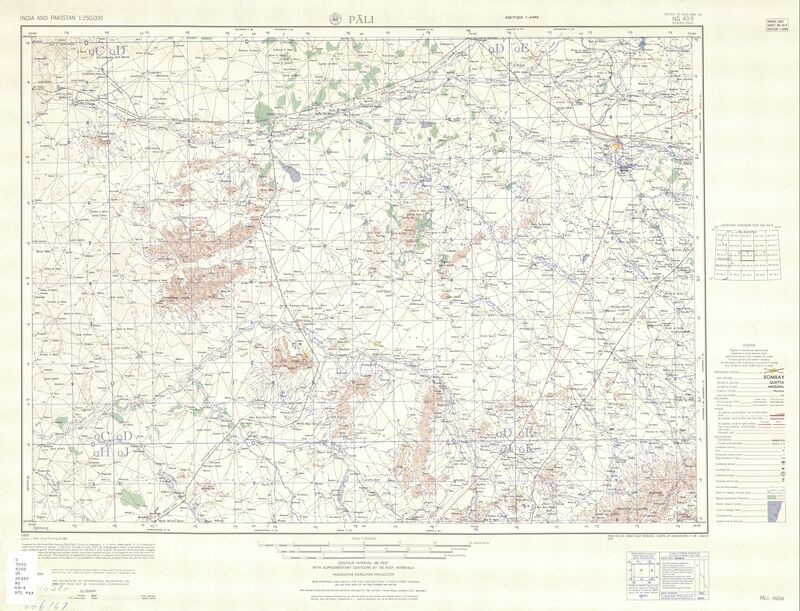 "Rivers: Luni Basin". Water Resources Department, Government of Rajasthan. Archived from the original on 18 October 2012. Wikimedia Commons has media related to పలి జిల్లా. బార్మర్ జిల్లా, జలోర్ జిల్లా. రాజ్‌సమంద్ జిల్లా. ఈ పేజీలో చివరి మార్పు 29 మే 2017న 06:48కు జరిగింది.